transmitNOW is an international forum with a network of experts that creates and transforms ideas into innovative, sustainable and impactful projects and businesses in the creative industries. The goal was to plot the course for an annual event that could strategically address the evolving challenges and opportunities facing the creative industries starting with the music business. Held at the Opus Hotel, this initial gathering was tight on space and resulted in a practical solution: participants were split into two separate round table settings and put to task on the same issues.This pragmatic approach generated fantastic discussion between label executives, publishers, managers, festival buyers, entrepreneurs, experts and government bureaucrats from across the globe. This resulted in high quality insight and guidance for the proposed event at hand. By proxy, the group decided that the roundtable format would be the best way to approach the design for dialog. Participants also confirmed that an invite-only format for no more than 150 global leaders, thinkers and creators held the most promise of bringing forward result-bearing solutions. The agreed upon axiom was that “less is more” when it comes to solving problems in group environments. With growing support across many sectors of the creative ecosystem, Transmission bloomed. Marrying amazing leaders, large industrial challenges and cross-sectoral dialog with high production value and world class programming, the formative years of this one-of-a-kind gathering introduced new conversations to those in the content ecosystem and showcased some soon-to-be superstars (K’naan, Fleet Foxes, Champion).In 2006 — Transmission’s official launch — it was evident that through the pre-determined roundtable format, real issues were being addressed through the methodologies employed. Comprehensive pre/post event interviews/surveys determined that the process could successfully align conflicting and disparate viewpoints by a factor of 40% over the course of two days. It was clear to us that transmission had great potential to facilitate consensus without compromise. Working hard to make sure that all sectors were represented accordingly at each event, we pushed together stakeholders that typically did not/could not/would not connect with each other on endemic issues facing the entire creative ecosystem. And by enshrining key values such as Chatham House rules (conversations undertaken with a soft condition of confidentiality), we found that the roundtables became a platform for attendees to vent deep-seeded frustrations, and confess to fundamental systemic failure often resulting in cathartic information sharing. From 2007-2008, talk of bringing ISPs into the value chain evolved into discussions about the future role of devices and operating systems. The list of game-changing participants included global entrepreneurs and fearless pioneers, all sharing valuable knowledge and insights on the Transmission stage, only to be found in heated debate later that day at a roundtable discussion. 2009 was a year of transition. Transmission scaled into markets such as Asia and Europe. And later that year, we collaborated with a dynamic young music festival, Rifflandia, relocating the Global Summit to Victoria.It was at this time that we began our migration from ideation to execution: a focus on outcomes. We needed to balance our blue-sky narrative with a serious look at the environmental conditions we were already working in. Ideas and discussions were great, but what about new unorthodox revenue channels? Unidentified consumer behaviour? And what about the rapid iteration of new products and technology? While Transmission’s reputation continued to grow, there was a desire for a more agile and fluid format: a philosophy that deftly responded to the real time challenges and industrial problems faced by our participants. 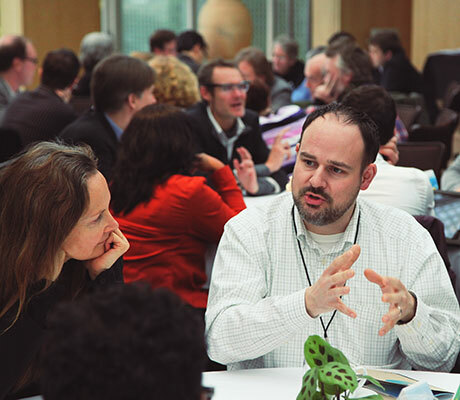 To achieve this, the event would require more adaptive framework, more effective tools to engage participants and focus energy on outcomes connecting roundtable discourse to post-event action. After an extensive global search for best practices to align with our existing process, we were introduced to the Value Web and MG Taylor Social Technology. With an extensive track record for exceeding expectations in key environments such as the World Economic Forum and the United Nations, it was clear that there were massive benefits to our process and in turn our participants and sponsors. These collaborative design systems would, for the first time ever, be employed in the creative content ecosystem. By the time we had reached 2012, we had increasingly integrated MG Taylor methodologies into our practices for large-scale events in North America and Asia, while also doing more specific design sessions for companies, government and academic institutions. This turned out to be a philosophical change to how we did business as we realized we could even deploy these same practices in our venture acceleration program, transmitFORGE. At every turn, we witnessed better outcomes and improved processes. It also led to a growing network of companies and organizations seeking us out for more applied work.The self-realization of our coming of age took place in 2012 with Transmission Global Summit and in particular, transmitBC (a specific focus on West Coast screen based media). First, full integration with MG Taylor Social technology could and would change the very nature by which people and social systems interact. Second, that it was imperative to the success of Transmission, that we take a step back to fully grasp the potential of these processes and work towards being the most relevant platform for sharing knowledge and delivering actionable outomes in the creative content ecosystem. Third, it was clear that Vancouver could and should be the home of Transmission’s next evolution. April 11 & 12, 2013 in Vancouver: We Engineered the next major Transmission event model. After meeting with our sponsors, our board, and key stakeholders in Vancouver, we decided with collective intent to postpone the full Global Summit and use this time to explore new ideas and bring together our core network to design a truly powerful platform for the next iteration of Transmission. As part of this exploration process, Fantan held a two-day workshop composed of 50 participants in Vancouver on April 11th and 12th in 2013. The aim of the design session: to start looking at the re-invention of transmission. Participants worked together to solve problems that affect all of us and focussed on inter-organizational collaboration, actionable outcomes and overall sustainability. The key outcome was the announcement of a completely evolved model for a future TGS event that will be designed for a greater number of participants, informing more related sectors from many more countries. Woven throughout the future programme will be a specific focus on Vancouver as a global destination for innovative enterprise and collective problem solving. WOULD YOU LIKE TO RECEIVE UPDATES ON THE FUTURE OF TRANSMISSION?